Above, interior of Chapman Radcliff, in L.A., photographed by Jason Todd for House & Garden. I like the idea of finding a modestly priced Queen Anne-style chair at a consignment or used furniture shop, sanding the chair, and then painting it an eye-popping color like coral, lime-green, or brilliant yellow, for a little girl's room. Often this style chair has a "drop-in" seat which is fairly easy to reupholster, without professional help, in a fun bold pattern. The sophisticated lines of a Queen Anne (like the chair above) can be unexpected in a child's room, and later as an adult she can still use the piece -- maybe repaint it glossy black. 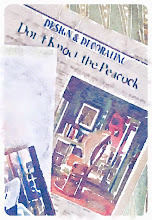 BTW: Obviously I mean paint a reproduction chair, not a pedigreed antique! Related reading: Queen Anne Furniture: History, Design and Construction. 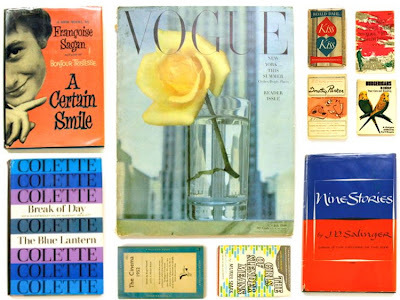 Inspired by a December 2006 exhibition of book covers organized by Andy Spade, titled "an argument for looking at books instead of reading them," Kate Spade online is offering downloadable collages of vintage covers that can be used to make a new book jacket, or used as computer screen wallpaper. The company also shares a suggested summer reading list. Image above, 1971 rare edition of Jansen Decoration, Mecox Gardens. This boldly striped desk -- just in at Providence -- might offer a little inspiration for a kid's desk transformation. The look offers a sophisticated way to bring in favorite sports team colors, or school colors, without going for a full-throttle theme room. Boys ages 9 to 12, who are growing up yet still slightly interested in doing a creative summer project with their mom or fun aunt, could design something very sleek. Those with a bigger budget could makeover a metal desk by taking it to an auto paint shop, as Angele Parlange describes doing in her book, Creole Thrift: Premium Southern Living Without Spending a Mint. BTW: the Providence desk costs $695. Also in the shop at the moment is a small round gilt and glass table, resembling the table seen in Hadley Inspired. The base of Providence's piece is a floral bouquet, rather than wheat. For more on Parlange, see Adventurous Spirit: Angele Parlange. 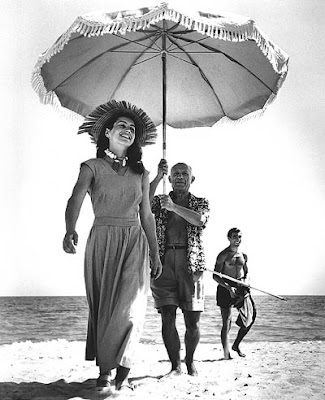 Robert Capa's famous 1948 photo of Francoise Gilot and Pablo Picasso, in sunny Golfe-Juan, France, always puts me in the mood for summer. (That's Picasso's nephew, Javier Vilaro, in the background.) In fact, I used to keep it on an inspiration board. 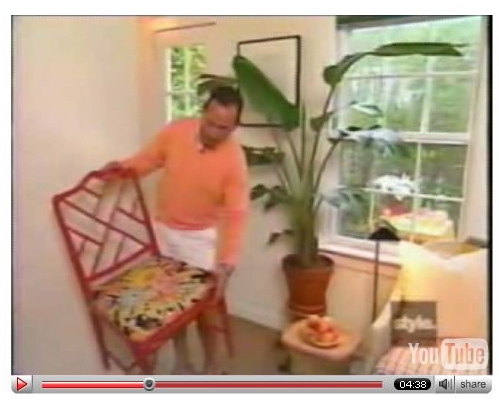 A great source for summer decorating inspiration is the Todd Romano/Elle Decor Video. I mentioned it back in February, but this is the perfect week to bring it back. Decorator Romano's colorful beach house is featured, and both Romano and Elle Decor Editor-in-Chief, Margaret Russell, offer commentary. The look of the place is sort of "Palm Beach goes Pop." You may remember it from Elle Decor, June-July 2001. Unfortunately for those of us in the U.S., Black & Spiro is located in Australia. Still, I had to share one of owner Anna's latest finds: the Happy Chic vintage stool, above. The original needlepoint -- maybe a flame stitch Bargello? -- feels so very Sister Parish. There's something though about the clear Kool-Aid colors and rhythmic pattern that also remind me of artist Sonia Delaunay. 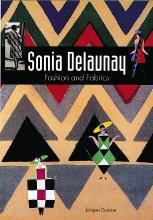 See also, Sonia Delaunay: Fashion and Fabrics. 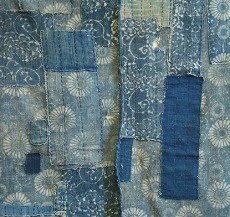 Recently, Megan, of the chic and fun new blog, Beach Bungalow 8, wrote about textile designer and illustrator Virginia Johnson. 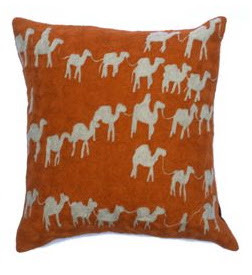 One Johnson piece that Megan highlighted happens to be my personal favorite: the camel wool pillow. Chain-stitched by hand in India, the 18"x18" pillow is available in orange, green, red, and blue, and costs $185. If Johnson's name or style seem familiar, you may remember her wonderful illustrations for Kate Spade's books, Style, Manners, and Occasions. Johnson also was profiled in Domino, January 2007. Here's Megan above. 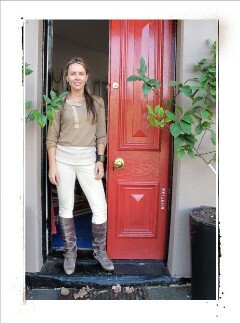 She is a talented interior designer and writer, so you will enjoy visiting Beach Bungalow 8. 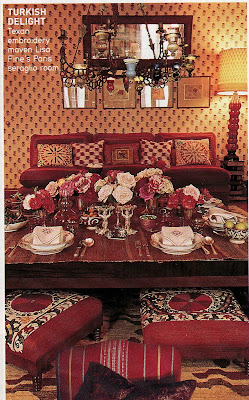 Months ago, I posted this photo of a Miles Redd-designed room, as seen in Elle Decor, November 2006. Since then, several readers have asked for details on the tiny tray with the Warhol-like image of the last emperor of China, Pu Yi. 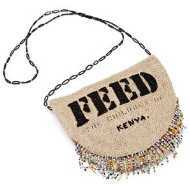 This weekend, I discovered a good retail source: the Freer and Sackler Galleries online museum shop. Here you will find the tray, signed Fabienne Jouvin, Paris. The piece measures 4.75"x7.75"x.75" and is available in various colors. $28.95. BTW: Because of its sumptuous colors and textures, Bernardo Bertolucci's film, The Last Emperor, is often on designers' lists of visually inspirational movies. Update: Nomita sent in this alternative tray source: Global Table, under other. This shop offers green, beige, fuschia, and orange. The Freer and Sackler Galleries shop has a few more choices. The light pink tray available through the Freer and Sackler Galleries has just sold out. 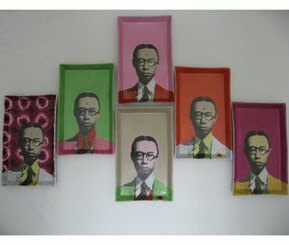 PEM currently sells the trays too. 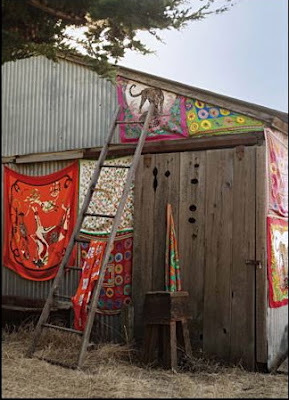 Photography above, Joshua McHugh for Elle Decor. 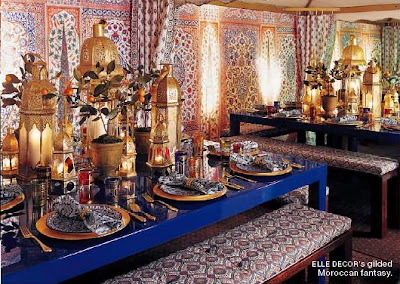 Yesterday I mentioned how much I like the Moroccan fantasy vignette created by Elle Decor for the annual DIFFA fundraiser, Dining By Design, 2007. Below are rooms in private homes where the owners wanted a similar exotic vibe. 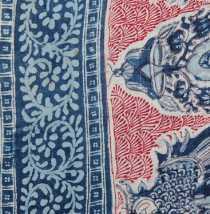 Some feel Turkish, some Moroccan, and others Indian, but all are enveloped in fabric and pattern. 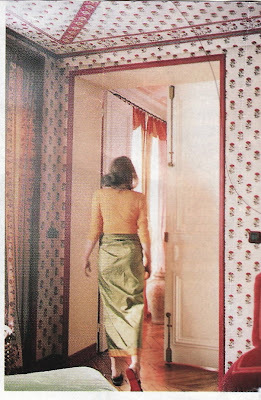 Above, Lee Radziwill's London drawing room, circa 1960s, decorated by Renzo Mongiardino; photo by Cecil Beaton as seen in Domino, April 2006. Image above, Lisa Fine's Paris apartment photographed by Ivan Terestchenko for Elle Decor, August 2000; another view below, Vogue Living, fall 2006. Below, rooms with Eastern flair designed by Michael Smith; the bedroom was photographed by Lisa Romerein for House Beautiful, October 2006. Below, bedroom designed by Peter Dunham, as seen in House & Garden, August 2006. 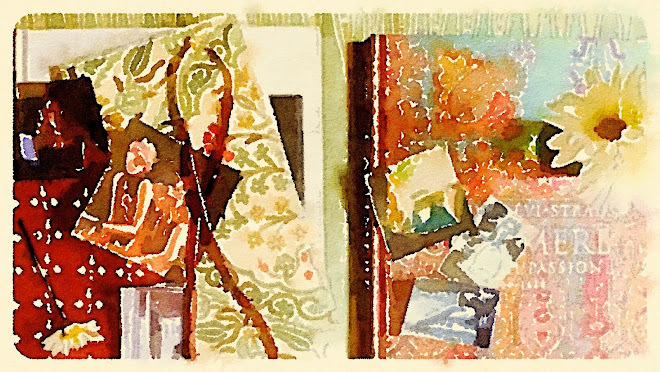 I included the Matisse painting here because the artist was a lifelong collector of textiles -- French and African fabrics, exotic Persian carpets, Middle Eastern embroideries. His collection inspired many interior scenes, like the one above, where pattern permeates the entire room. A great resource for fabric designers, or anyone passionate about textiles and Matisse, is the book, Matisse, His Art and His Textiles. For more on Renzo Mongiardino, see Designers on Designers : The Inspiration Behind Great Interiors. Related past post: Moroccan Chic II. BTW: Currently on view at The Met is an interesting exhibition that explores the impact of Near East style on Venetian art and design, Venice and the Islamic World, 828–1797. This week at the 19th annual International Contemporary Furniture Fair, Zia-Priven unveils its new Exotics Collection. Natural materials including unusual woods, alabaster, and marble dominate the designs, which are a bit more modern. 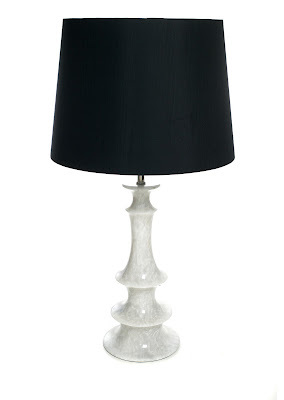 One of my favorite new pieces is the Rossmore marble lamp, above. The form of the base reminds me a little of architectural motifs found in North Africa and the East. 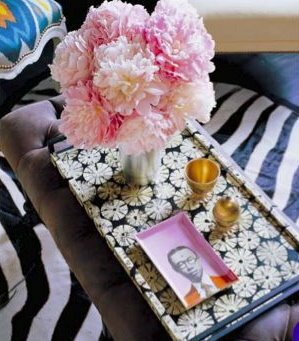 I adore Benjamin Moore's vignette, above, created for Dining By Design 2007; Photography below, Joshua McHugh for Elle Decor. 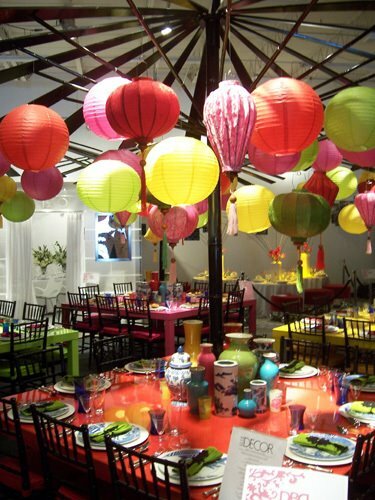 Admittedly, last year I got a little too obsessed with those magical Asian-inspired tables designed by Elle Decor Editor in Chief, Margaret Russell, for the annual DIFFA fundraiser, Dining By Design. 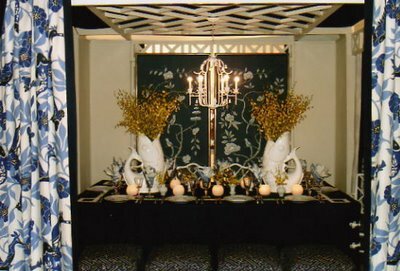 But I thought the tables were fabulous, and I love that Elle Decor's vignette is traditionally recreated in cities across the U.S., for a wide array of people to enjoy. Happily, the magazine's design for 2007 did not let me down. It's the layered Moroccan fantasy above. Over the next few months, the traveling event will stop in Dallas, June 20-23; Atlanta, October 24-25; and Chicago, November 1-3. Tickets for daytime viewings of the tables are very affordable (less than admission to most museums) and I'm always inspired when I attend. 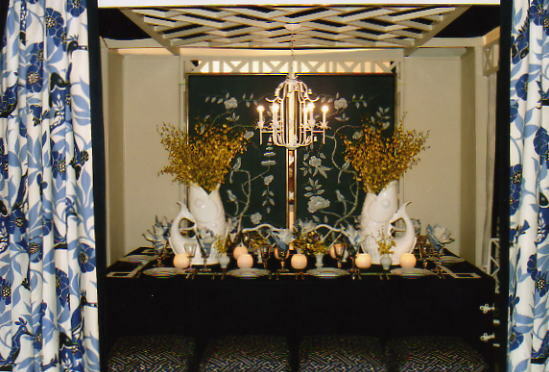 Image above, courtesy of the always stylish Alli, shows Russell's tables for 2006. 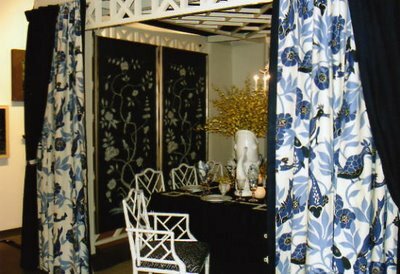 In person these were more spectacular, Below are a few pics of a fun vignette from Atlanta's Dining By Design, 2006; the designer was Kelly Crago Hansen and her inspiration came in part from famed Brit designer Oliver Messel. See also Channeling Oliver Messel. 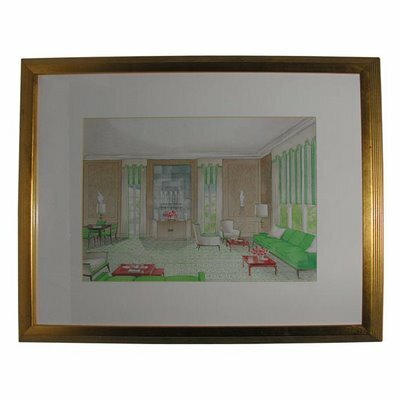 Above, circa 1950's pencil and watercolor rendering by mid-20th-century designer Tommi Parzinger, available through Palumbo. SCAD-Atlanta, the Atlanta campus of the Savannah College of Art and Design, offers some interesting open enrollment, non-credit design courses. 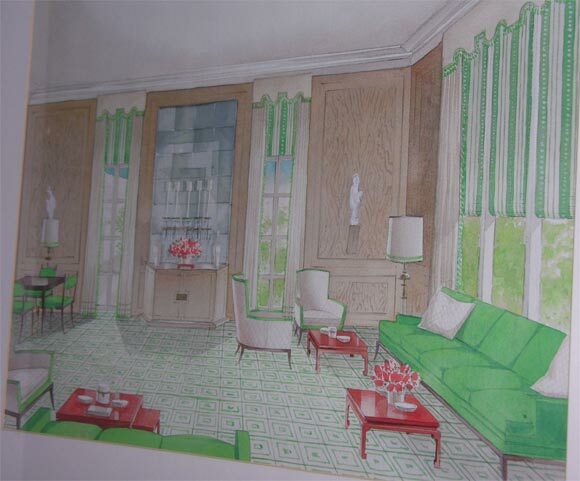 This summer, beginning June 18, drafting for interior design will be offered on Mondays from 7-9:30 p.m. Basic drawing skills and presentation techniques will be emphasized. 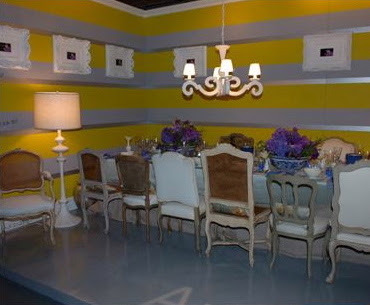 The 8-session class might be perfect for a self-taught decorator who wants to add some formal skills to her repertoire. Tuition is $250. Visit SCAD's site to learn more about the school's Community Education program (look under ACA Community Ed.) Registration for summer just began. Photography above, Nathaniel Goldberg for Hermes. The hippie luxe trend continues in a new video from Hermes, Soie sur la Route (Silk on the Open Road.) The story involves three "bohemian heroines" who improvise with their exquisite silk scarves. 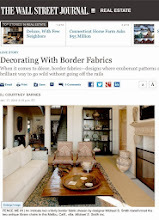 When I received a link to the video via email, I was reminded of the framed vintage Hermes scarf in Ivanka Trump's dining room, decorated by Emma Jane Pilkington. Some might feel this idea has been done enough now, and no longer looks fresh, but I still love it. Above, Ivanka Trump's Park Avenue apartment photographed by Oberto Gili for House & Garden, January 2005. 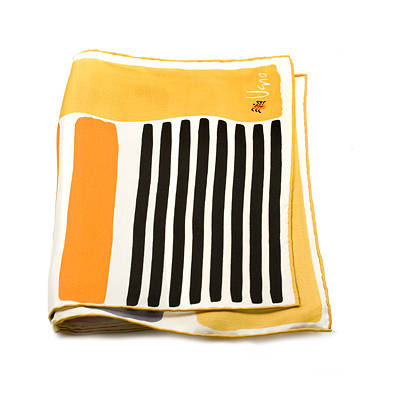 BTW: A while back, Lizzie over at Design Watcher posted some great reissued Vera scarves -- more budget-friendly options -- available through Auto, that could be made into pillows or framed. A sample is shown below. 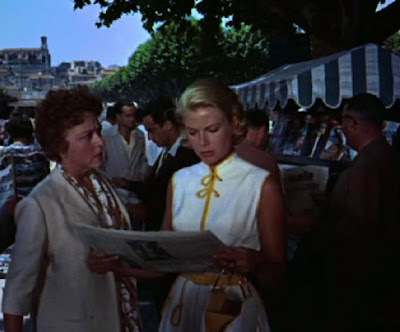 Above, stills from the 1955 film, To Catch a Thief, starring Grace Kelly. I thought I'd reached my limit on decorating makeover shows, but I have to admit Thom Filicia's new program, Dress My Nest, is pretty cute. 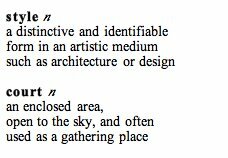 Filicia seems to have a gift for reading people and working with less than stellar spaces. He is also hysterical, with a warm on-screen persona. If you've never seen the show, Filicia revamps a young woman's apartment using her favorite outfit as inspiration. 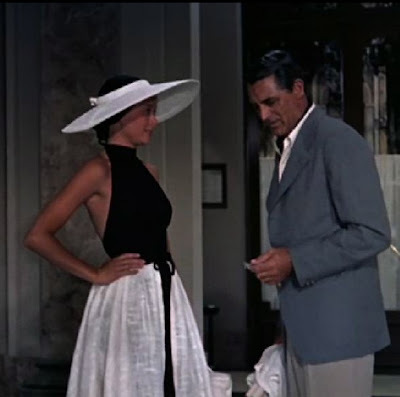 What I would love to see is an apartment inspired by Grace Kelly's crisp resort clothes in To Catch a Thief. 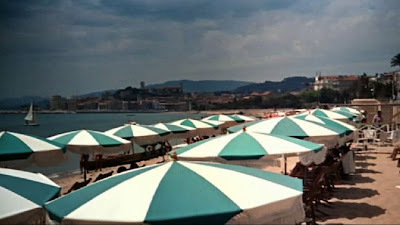 Set along the French Riviera, this movie is filled with clear colors and graphic contrasts. For me, it represents the ultimate in summer chic.